and get a rope to ring a bell"
You've heard the phrase standing room only. 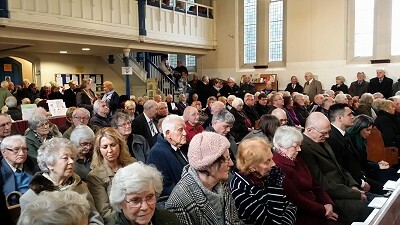 Well that was a pretty good description of Jim Sutherland's memorial service, which took place at All Saints, Wragby on the 2nd March. Even finding somewhere to park was a problem. The family was led into the church by a piper and the service was led by the Revd Mark Holden. One of Jim's poems was read out by his Granddaughter Bryony and Jim's son, Robin, delivered a fitting Eulogy. Music included the Bellringers hymn "Unchanging God" and "One more step along the world I go". The organ was played by Les Townsend, who played the "Lincolnshire Poacher" as people left the church afterwards. There was open ringing on the bells after the service, with many people partaking. Later we made our way over to the Turnor Arm for buffet refreshment and a cup of coffee and to reminise about Jim. Several Peals and Quarter Peals and other ringing has taken place across the county in memory of Jim and I daresay some more ringing for Jim will take place in the future. However after the wake at the Turnor Arms, 6 ringers went back over to the tower at All Saints, the tower where Jim was Tower Captain for 30 years and rang this peal in memory of Jim Sutherland. 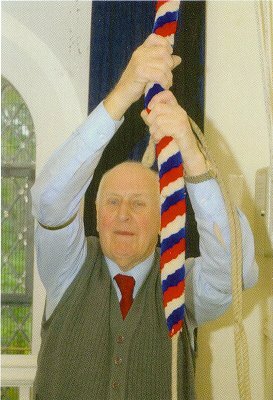 Rung in affectionate memory of James A Sutherland �Jim�, Tower Captain at this Church for 30 years and Honorary Life Member of the Guild, on the afternoon of his funeral. The ringers of 1, 4, 5 & 6 were all taught to ring here at Wragby by Jim. The father of 2 was Tower Captain here at Wragby immediately prior to Jim. The band wish to associate Colin Ward & Tony Barker with this peal. Jim left instructions for the seven methods that he wished us to ring in the peal today (No Doubles!) along with the band he would have liked to have rung the peal, being the four ringers he taught (1,4,5,6) and Colin & Tony who both have strong connections to ringing at Wragby and to Jim. Unfortunately both Colin & Tony were unable to ring in the peal today. �Well done thou good and faithful servant� Rest in Peace dear friend and mentor.